Far smaller than most rooms and therefore less expensive to overhaul, your powder room is just as worthy of attention as larger and more frequently visited bathrooms. After all, in many homes, the powder room is the primary restroom for guests. Why not make guests feel pampered in a room that has been specifically designed with their comfort in mind? Powder rooms grant you the freedom to break away from the design themes that dominate the rest of your home. It's okay — even encouraged — to change it up with the powder room and grant it a different personality. This is perfect if you like a particular style but aren't willing to commit to it on a grand scale. From flooring to backsplash, tile can serve many functions in your powder room. While many homeowners play it safe with predictable styles, the powder room environment is well-suited to daring designs that might not work elsewhere or would simply be too expensive in larger rooms. Forget that conventional white subway tile; this is your chance to play with chevron or mosaics. Take a risk with bright colors or with texturized tile. 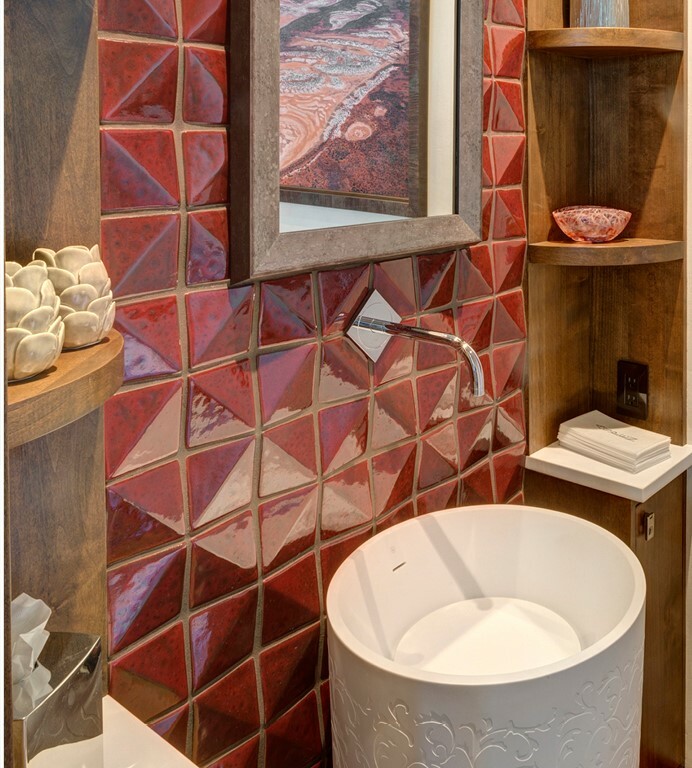 Integrate a sculptural feel with dimensional tiles, which make your powder room feel like a work of art. 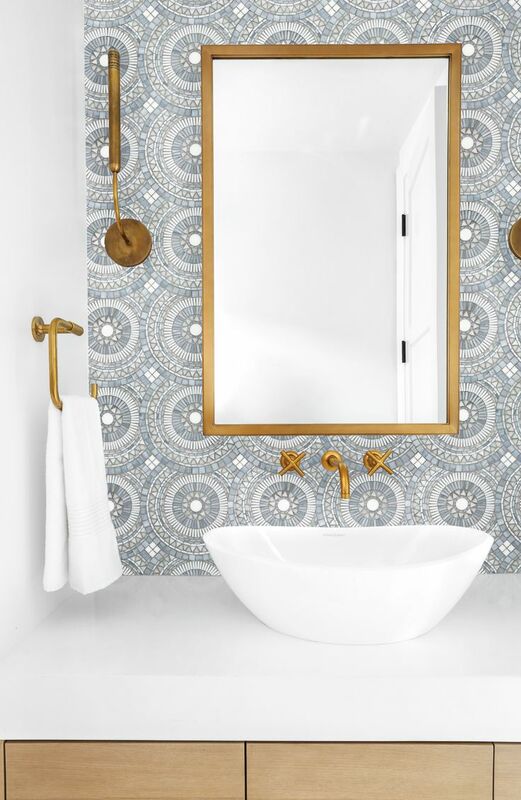 Modern bathroom tile is at its best in the powder room environment, where adventurous colors, patterns, and textures can be tried on for size. 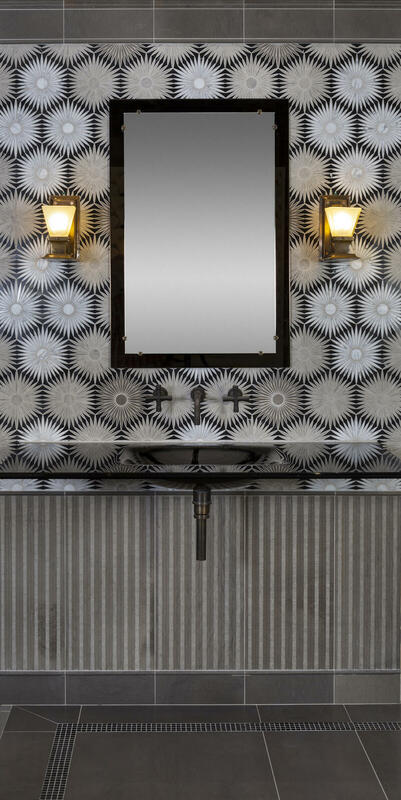 A lovely example of making the most of powder room tile: a design by Annie Grice that deservedly won first place for the powder room category at the National Kitchen and Bath Association Design Competition. 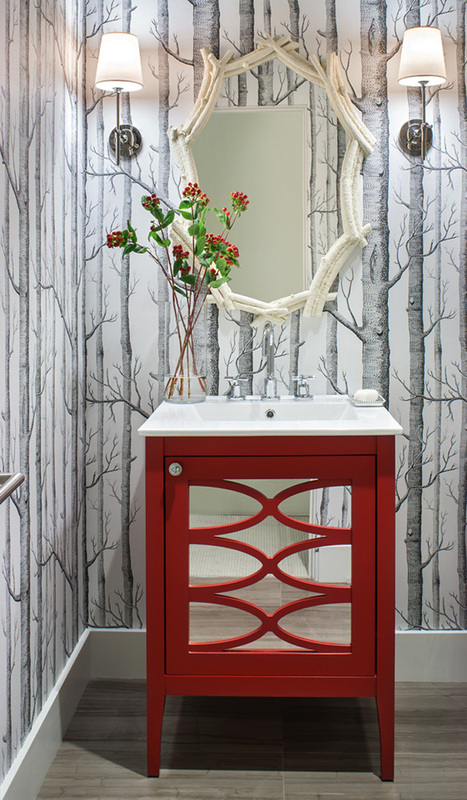 This stunning powder room features a dimensional accent wall dominated by an attractive deep red hue. Throughout this Aspen home, Grice aimed to create a "warm and inviting palette." Despite its diminutive size, the finished product clearly captures the mountain contemporary vibes she sought to evoke. Wallpaper is back — but it never should have gone out of style in the first place. Easy and inexpensive to integrate into both powder rooms and larger bathrooms, wallpaper provides the perfect opportunity for changing it up with an eye-catching design. As you survey your options, consider going bold with daring designs. Intricacy is always appreciated; aim for patterns that would be difficult to recreate with other design elements. From quirky and whimsical to sophisticated, the right wallpaper can instantly evoke a specific mood. 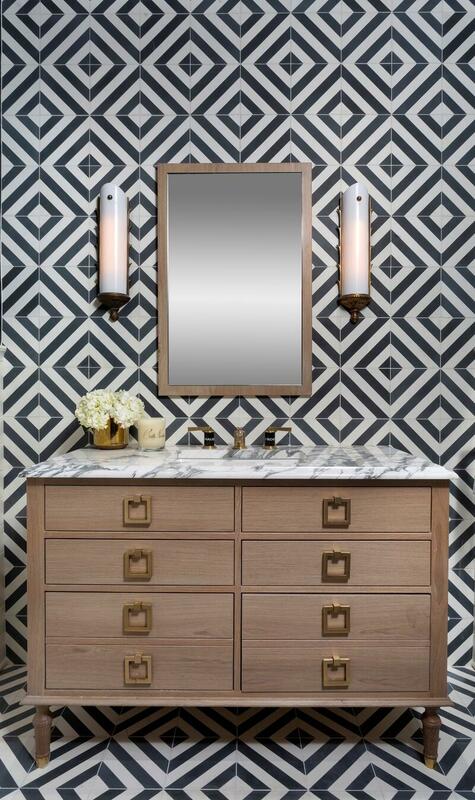 Lighting can make or break an otherwise beautifully designed powder room. Accent lighting is essential; properly integrated downlighting or sconces can highlight the most impressive design elements — such as three-dimensional details — while drawing the eye away from less impressive features. Task lighting serves a more functional purpose, allowing guests or residents to primp and preen as they see fit. Proper task lighting can grant guests a powerful confidence boost, so avoid anything that could cast unflattering shadows or age individuals as they observe themselves in the mirror. Light fixtures and switches aren't merely meant to illuminate your powder room; they can prove decorative in and of themselves. Don't hesitate to select unique designs for ceiling and vanity lights — today's designers are going bigger and bolder than ever, so opportunities for personalization abound. Often thought of as purely functional, hardware can serve a surprisingly decorative purpose. If you prefer to keep it simple with tile or wallpaper, hardware can provide much-needed visual interest without feeling overly risky or dramatic. Think of hardware as your powder room's version of jewelry or fashion accessories; it can either be the cherry on top of an already stylish 'outfit,' or a means of dressing up an otherwise conservative look. No matter your preferences, hardware should match the general vibes of the room; seek contemporary fixtures to complement modern designs or elegant hardware to accompany old world style. If you're nervous about changing the look of your powder room, start small. Something as seemingly insignificant as a sink faucet could completely transform the character of your room. For a quirky touch, replace tired cabinetry hardware with corkscrew-shaped or bejeweled knobs. The moment you set foot in your powder room, you should be taken aback by the creativity on display in this small but important room. Don't let this amazing design opportunity go to waste. 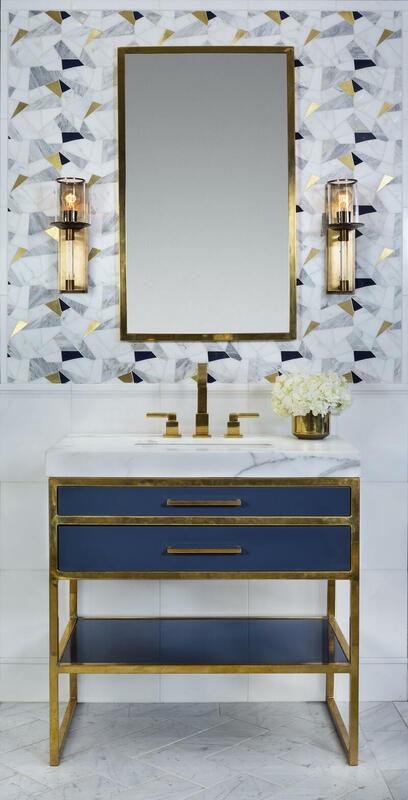 From dimensional tiles to bold lighting fixtures, a variety of unique elements can be called on to create a beautiful and memorable powder room design. Are you ready to make your powder room pop? We're here to help. Check out our Design Style Guide to get a better sense of your options for amping up the style in your powder room. Contact us online or visit our Denver showroom today to learn more.